One who reaches all.Om sarvagAya namah. sarvatra gacchati iti sarva-gah - One who pervades everything. Or, by His strength which displays His capacity to support, He supports everything He has taken in during the pralaya, and thus He reaches all. One who is the All-knower. Sarvam vetti vindata iti vA sarva-vit - One who knows everything or One who obtains everything. In the first interpretation, bhagavAn is the knower in all - the inner soul. In the second interpretation, He performs the function as pradyumna and recovers or obtains all the jivas that have been absorbed into Him in the form of samkarshaNa. In spite of His act of creation and maintenance, He remains unchanged and continues to shine undiminished. One who has His army in all directions for the protection of all. SrI Bhattar interprets this nAma as referring to aniruddha, the protector. The word senA is derived from "inena vartate iti senA" - where inena means svAmin saha. So sena is one which is with the Lord always - seSvara. This nAma indicates His Sakti which indicates His capacity. a-niruddha refers to One who is not under anyone else's control. This nAma also indicates the gUna of the Lord by which He is always there to protect His devotees. a) One who destroys the wicked. b) One who protects people from the wicked. c) One who is approached by devotees for their wishes. He is janArdana because He protects people from dasyus (demons). SrI Sankara gives the following two interpretations: One who destroys those who are wicked - janAn - durjanAn, ardayati - hinasti (destroys). ard also means to beg, to ask - gatau yAcane ca. janaih ardyate - yAcyate - One who is approached by His devotees for whatever they want. One who is the embodiment of scriptures. "sarve vedAh sarvavidyAh saSAstrAh sarve ya~jnAh sarva ijyASca kRshNah"
"All the veda-s, all the vidyA-s, all the Sastra-s, all the ya~jna-s, and all offerings, are kRshNa". The true knower of the meaning of the veda-s. This nAma appears once more in this slokam itself (nAma 133). Vedam, vedArtham vetti iti vedavit. Or, vedAn vinte - vicArayati iti vedavit. One who knows the veda-s, or One who spreads the knowledge of veda-s (e.g., in the form of pradyumna, vyAsa, etc.). He is vedavit since He is the knower without any doubts or errors of interpretation, and He is the only one. In gItA the Lord says - vedAnta-kRt vedavideva ca aham - I am the author of the upanishads - vedAnta-s, and I am indeed the knower of the vedas (gItA - 15.15). He is also vedavit in the sense of knowing the true meaning behind the veda-s, viz. dharma. SrI Bhattar interprets this nAma as representing the pradyumna incarnation - as one who propounds the Sastra-s and explains their significance. samkarshaNa who has knowledge as one of His attributes. One who has no imperfections. vya~ngam is imperfection. a-vya~ngam is no imperfection. In the context of the previous nAma-s relating to His originating veda, and His full knowledge of veda, this nAma means that He is not in any way deficient in the knowledge of the chandas, kalpa, and other accessories of the veda-s which He himself has created. One could also interpret the nAma as meaning that He is not deficient in any way in any of the six guNas - ~jnAna, bala, aiSvarya, vIrya, Sakti, and tejas. a) One who has veda-s as His body. b) One who has the sruti-s and smRti-s as His body. "trayImayam rUpamidam ca saukaram - One who has the varAha form which is the veda svarUpam" - (SrImad bhAgavatam 3.13.41). One who knows not only the veda-s, but the true meaning behind the veda-s, viz. the dharma. Please see the explanation under nAma 130 for the interpretation of the guNa expressed by this nAma. One who cognizes beyond ordinary perception. krAnta-darSitvAt kavih - sarvadRk. One who sees beyond what is revealed only by the senses. 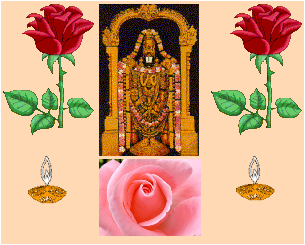 BhagavAn is the best among the kavi-s.